Month after month sales began to creep up, and the vital signs behind the company were always good. Everyone liked it, traffic to our website slowly began to creep up, and a lot of the seeds we planted eventually began to harvest. They’re still being harvested right now, but everything seems to be going pretty well. I’ll use this post to give a brief synopsis on how the company got started. Technically Health Kismet is about 7 months old, although Incredible Greens has only been on sale for about 3 months. However, the initial concept for the product began about 1 year ago. I went to school for nutrition and was about to get my Ph. D. when I decided it wasn’t for me and instead went into banking. Which as it turns out, also wasn’t for me. Interesting topic, terrible culture. I did some traveling after that with the savings I had built up, and it was during this time that I began to contact manufacturers about possible products. Initially I was undecided about whether or not I wanted to create a liquid or powder. However, it turned out that liquids are much more expensive to start. Order minimums are usually around $250,000. That’s a bit out of my budget since I started the company from my own private savings. So instead I went with a greens powder. I’ve used them myself for a long time, and was very familiar with the different product offerings. There are probably a decent amount of people who would take a greens powder if they didn’t taste like dirt. Very few, if any supplement companies do a good job with the web 2.0 business model. They either go entirely through the retail channel or aggressively use affiliate marketing and skeezy sales tactics. A supplement company started by a nutrition guy with a good grasp of design and social media is probably a good starting point for a supplement company. Our web presence is probably as big or bigger than just about any other supplement company, and is growing at a steady clip. What hasn’t gone as well? We’ve made aggressive use of discounts and coupons, and have had fairly small profit margins so far. Ironing out wrinkles in our business systems is still a work in progress. This includes finding the right contractors for non-essential work and most importantly, streamlining our order fulfillment process for international orders. The latter problems are all solvable, so overall I’m optimistic. Nailing down international order fulfillment. Canada is first, and we’d like to expand to GB/continental europe after that. Putting our berries formula into production. Refining our content marketing into a package that’s more structured and useful to improve visitor retention. Interesting story. 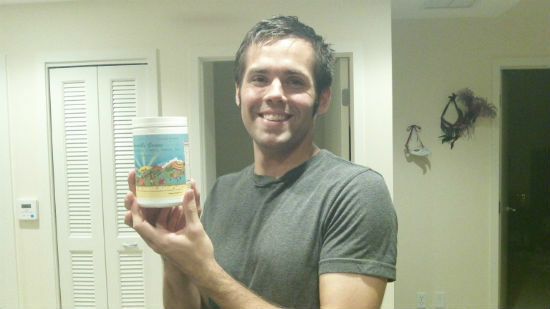 Just curious….how did you decide to get started in the supplement industry. It seems like an unusual expertise to learn in school. I learned about nutrition in school and the science behind it, but not so much the business end behind it. That was entirely self-taught and learned on my own over the course of one year or so. Of course, it’s still going on today. I’m not aware of anybody that has learned about manufacturing and industry specific workings in school. At least not that I’m aware of. Do you supply to/in Canada? What is shipping cost. Tks. Ashley, we do currently ship to Canada, and our shipping charge is $6. However, we actually just ran out of inventory. I can let you know when our new shipment comes in. Thanks! Why do you have so much soy in your greens, soy is very unstable. My Dr. said stay away from it. The soy in Incredible Greens actually does the exact opposite…..it’s very important for stabilizing the nutrients in the mixture. Lecithin is very helpful for allowing nutrients to survive the gastrointestinal tract and get taken up into the cells.